His knowledge is not like ours, which has three tenses: present, past, and future. God's knowledge has no change or variation. 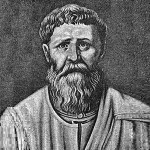 Comments on: "Augustine of Hippo Quotes: His knowledge is not like ours, which has three tenses: present, past, and..."
As love grows in you, beauty grows too. For love is the beauty of the soul.